Dried beans such as navy beans, red beans, pinto beans, black beans, and cannellini beans are delicious when cooked properly. The simple tips below will help you cook up a perfect pot of beans—and leave you wondering why you ever bothered with the canned versions! Many bags on the supermarket shelves contain beans that are many years old, held in silos until they come to market. Health food stores and bulk sections may have a higher turnover and fresher beans (even 1 to 2 years old is fine). Or, consider buying beans directly from a bean grower. A reliable source is Rancho Gordo Beans. Dirt and pebbles from the field and dust from the silo and who knows what else from the bulk bin.... Give dried beans a quick rinse with cool water and then a quick once-over for any bits of rock hidden in with the beans. The fresher the dried bean, the less dependent on soaking it will be, but if you think ahead, put the beans in a large bowl and cover with cool water for a few hours and up to overnight. Or, try this Quick Soak Method. 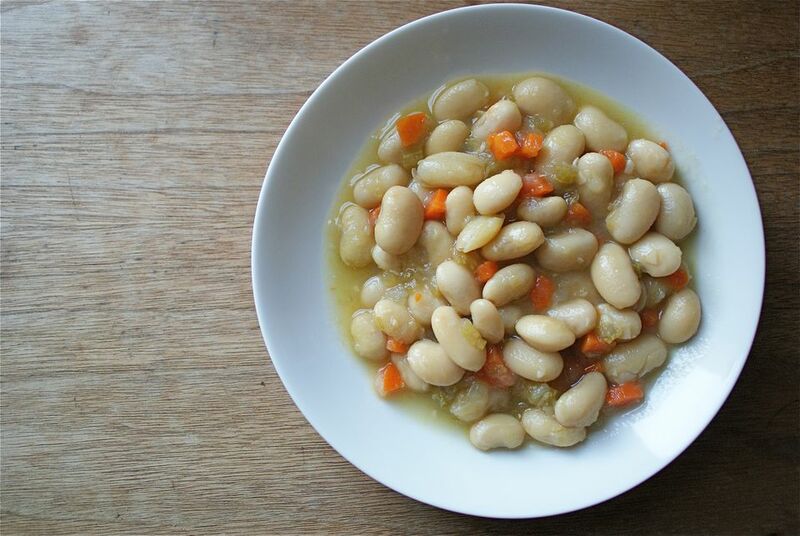 This is purely optional, but you can create a delicious dish from plain cooked beans if you start them off in a pot in which you have already heated a few tablespoons of olive oil and sautéed a finely chopped onion, a carrot or two, and a stalk of celery. Add a clove or two of minced garlic, if you like, and a bay leaf if you have one kicking around. You can certainly use the soaking liquid if you like, but some people find that using fresh water to cook the beans helps mitigate the gas-y effects of the beans later on. In either case, use enough water to cover beans by about an inch. Once you've brought the pot to a boil, reduce the heat to simmer and cook gently until the beans are as tender as you like them. This can take anywhere from 30 minutes for smaller, fresher beans, to two hours for larger and older specimens. Salt can toughen bean skins, but a lack of salt leads to tasteless beans. What's a cook to do? Adding salt when the beans are about 3/4 of the way done avoids the toughening but adds the flavor. How will you know when they're 3/4 done? When they start smelling like cooked beans and they are bite-able but not yet tender. Drain or Serve With the "Pot Liquor"
Good cooks know never to toss the liquid in which the beans cooked. It's delicious. Even when cooking beans to use in a salad or something else, smart cooks the bean cooking liquid as a base for a soup. There is a reason "pot liquor" is often written "pot licker"! Want to keep the beans around to use later? Store them, covered with their cooking liquid, in an air-tight container in the freezer for up to a year.